On Saturday, September 6, Hive Chicago joined Indie City in celebrating independent games as a supporting sponsor of Bit Bash, which after months in the making finally came to fruition as around 1400 people converged on Threadless Headquarters in the West Loop to play games, look at art, listen to DJs and eat from great food trucks. 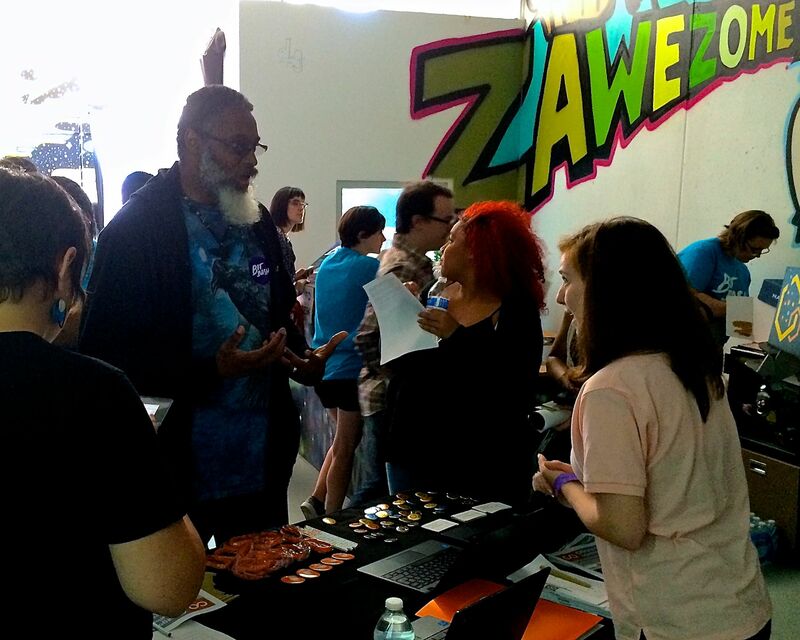 The Hive Chicago Network was represented by a selection of member organizations that focus on game-like learning strategies and educational game design, including: Iridescent, CICS Chicago Quest, Ci3 Game Changer and Youtopia, as well as Hive friend, Freedom Games. Personally, as a member of both the Bit Bash planning committee and of Hive Chicago as the founder of Important Little Games, I wanted to reflect on the potential of Bit Bash for Hive. While there are games that emphasize systems and rules, there are others which are more like discussions of human nature. 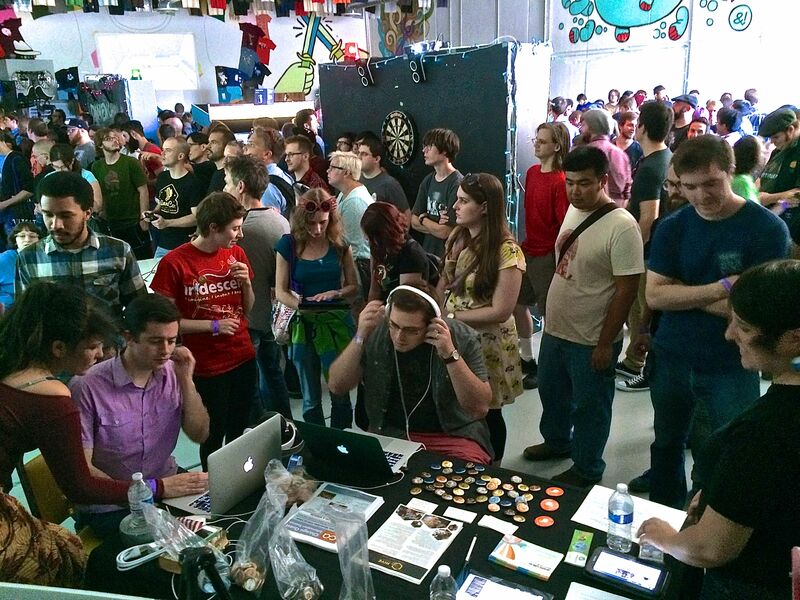 The heart of Bit Bash was not videogames, but people. Our choice of games reflected that emphasis, including local multiplayer games like Johann Sebastian Joust, Gang Beasts, and Killer Queen. At the center of the Hive, though we often deal with issues of logistics or funding, is people. Young people. It’s the human brain that both educators and game developers deal with, primarily. What interests them? What motivates them? What will prepare them best for the expectations they’ll be asked to meet in the future? Let’s take a look at some things that a festival of indie games is uniquely well suited to teach. As opposed to the big-budget games to which most press coverage is devoted, which are made by monolithic corporate entities, independent games are typically made by a small team. Being able to put a name and a face to a work of digital art allows youth (and adults) to more easily imagine themselves in the role of game creator. Depending on your views on digital games, that may or may not be a virtue in itself. If you are skeptical of the value of a career in games, consider instead that the skills used to make games — user-centric design, programming, illustration, animation, 3d modeling, sound design, musical composition and recording — are applicable to more and more fields of endeavor as time goes on and the world becomes more digitally-mediated. An incredible proportion of the programmers I’ve met — programmers who work on banking software and healthcare databases and web development — say that they started programming in order to make games. When people think of videogames, generally a few images spring to mind. Perhaps they think of Pong or Mario. More likely they think of Grand Theft Auto or Call of Duty. While the effect on players of these games themselves is still an active research topic, I think it’s safe to say that the culture that has grown up around games like these is unquestionably negative, as the recent #GamerGate debacle has proven. Exposure to games like the ones at Bit Bash shows that digital games can be more than murder simulators and breeding grounds for misogynist attitudes. Games can be works of personal expression. Independent games are the products of entrepreneurship. Every successfully produced game has been very consciously financed, either by the creator’s day job, or by their previous game, or through investment, or crowdfunding. It takes many non-technical skills to sustain a small company for the 1-3 years it takes to build a quality independent game. It takes leadership, teamwork, and salesmanship. Financial experts both conservative and liberal claim that small businesses are crucial to the economic future of the United States. The value of entrepreneurship is implied in every pixel of these games. Fandoms are a rally point; a kernel around which the imagination can more easily crystallize. A growing number of published authors began as authors of fanfiction — fiction set in the same world or using the same characters as a popular entertainment. Many artists, too, start by drawing actors and animated characters they’ve seen before. As artists grow in confidence, their work becomes more and more original, but most can benefit, if only initially, from the training wheels of a familiar subject and an already interested audience. I’m so glad Hive Chicago formally joined the effort to put up this event. For next year, we’ve agreed to work more deliberately to bring youth into the experience to give them the advantages of everything I’ve said, and a fun evening besides. How can we do it? What are the best strategies to integrate what members of the Hive are already doing into a Bit Bash-like experience? Who’s interested? Next year, I hope you’ll be there with us too.